You might recognise the multi-seed mixture from the pain d’epices I made a little while ago. Well, I had a lot left over, so I needed to do something with it. I hate buying bread. I can never get anything of good quality from the supermarket, and the only bakery I trust is at least an hour’s drive away, and is only available in Salt Lake during the Farmer’s Market. So, during the winter months, I have to be content making my own bread. Which is very, very difficult, since my apartment is very cold and it takes a long time for bread to proof. I usually have to plan ahead: watch the weather reports for the upcoming warm days, bake something else so the kitchen is warm, and do my baking as close to mid-day as possible (which means the weekdays are out, since I’m stuck at work, daydreaming about baking). Combine flours and dry yeast in a large bowl. Mix everything else in a smaller bowl until it is well combined. Make a well in the flour mixture, and pour in the liquid mixture. Stir vigorously (or use the dough hook on your electric mixer–I prefer to do this all by hand). Turn the dough out onto a VERY well-floured surface and knead. At first, the dough is going to be very sticky, but as it absorbs flour and the gluten develops, it will be easier to handle. Spray a large bowl with cooking spray/oil whatever, put the ball of dough in, turn it so it is well oiled, and cover with plastic wrap or foil, and put in a warm place. Let the dough proof for an hour or so, or until it is doubled in size. Give it a good punch, then form it into a loaf shape, grease your loaf pan, put the dough in there, brush it with an egg wash (a lightly beaten egg with some water added, or some milk), then spinkle the seed mixture on top, then carefully brush again with the egg wash (or milk) to “lock in” the seed mixture. Cover, and let rise about 30 minutes in a warm place. Bake at 350 F for about 30 minutes. Let it cool almost completely, slice it open, and enjoy! The “seed mixture” I refer to is here. Isn’t it wonderful being able to create something as delicious and simple as a loaf of bread. 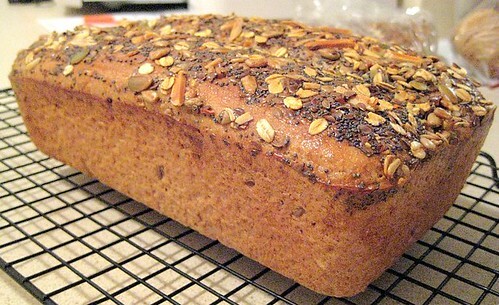 Your Multi seed bread looks wonderful! Cakebrain- once you get off your low-carb diet, you’ve got to try this! It’s so simple and great! Chuck- you’re absolutely right! I rarely buy bread anymore. It’s too easy to make your own, especially this recipe! I don’t do baking in fact, I only cook so that I will eat to survive. So I am always amazed at people who does all these wonderful things. It’s a gift. Looking at all these wonderful pictures you’ve taken of your work, especially this bread, it’s just making me hungry at 1am. Cheers! It looks amazing!